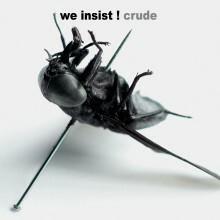 Crude (2004) - We Insist! We Insist! Recorded in live conditions in a short time-frame at high level in the studio Le Triton, "Crude" was mixed at Sriracha Studio from January to February 2004. This third full length record from We Insist! is more direct and aggressive than previous material. No more instrumental tunes can be found here, instead there are vocals everywhere and the songs are sharp and short. A more experimental metal and post-punk project rather than a sometimes jazzy influence, "Crude" is We Insist! 's big turning point.